There will be many subsystems in a data acquisition system. They can be time shared by two or more input sources. The numbers of techniques are used for time shared measurements depending on the desired properties of the multiplexed system. Some important techniques are explained here under. The multichannel DAS system is shown in Figure. It has a single A/D converter preceded by a multiplexer. As can be seen from the figure there are four inputs analog in nature. There can be number of inputs. Each signal is given to individual amplifiers. The output of the amplifiers is given to Signal condition circuits. From the output of the signal conditioning circuits the signals go to the multiplexer'. 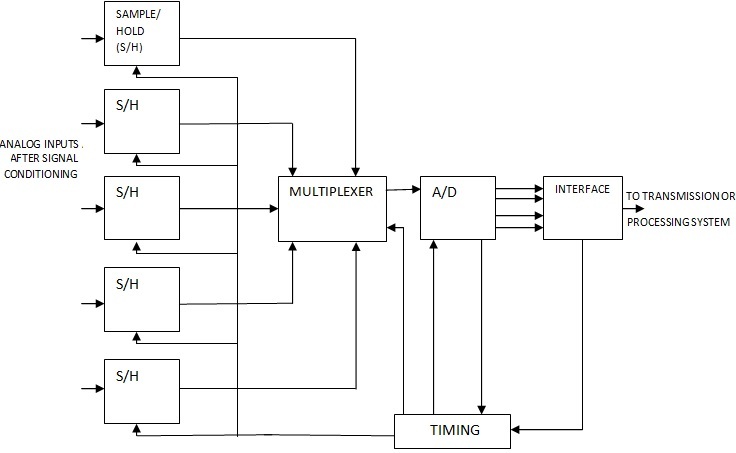 The multiplexer output is converted into digital signals by the A/D converters sequentially. The multiplexer stores the data say of the first channel in the sample hold circuit. It then seeks the second channel. During this interval the data of the first channel will be converted into digital form. This permits utilization of time more efficiently. When once the conversion is complete, the status line from the converter causes the sample/hold circuit to return to the sample mode. It then accepts the signal of the next channel. After acquisition of-data either immediately or on a command the sample hold circuit will be switched to the hold mode. Now conversion begins and the multiplexer selects the next channel. This method is slow. Sample hold circuits or A/D converters are multiplexed for faster operation. However this method is less costly as majority of subsystems are shared. If the signal variations are very slow satisfactory accuracy can be obtained even without the sample hold circuit. This arrangement is called simultaneous sampled system multiplexer. The block diagram is shown in Figure. When large number of channels is to be monitored synchronously at moderate speeds this method is used. The analog signals after signal conditioning are supplied to individual sample hold circuits. The sample hold circuits an updated synchronously by the timing circuit. 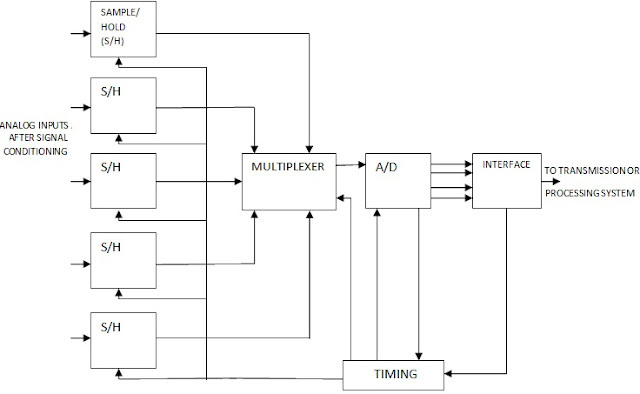 The multiplexer receives the outputs of all the sample hold circuits. The multiplexer is connected to the A/D converter. This results in a sequential readout of the outputs. With the availability of A/D converters at considerably lower costs, it is feasible to use individual A/D converters for each analog channel. The available digital outputs of several A/D converters can be multiplexed. The advantage here is that as the A/D conversion is on individual basis, the desired conversion rates can be used on individual channels. The parallel conversion scheme is shown in Figure. This type of scheme is advantageous in a data acquisition system that has several inputs distributed over vast plant area. The analog signals are converted into the required digital format at the source. Therefore transmission of data to the data centre can be made without line frequency and ground loop interferences. The data in the digital form will be used to perform logic operations and decisions. Depending on the relative speed at which data changes take place scanning rate can be increased or decreased. 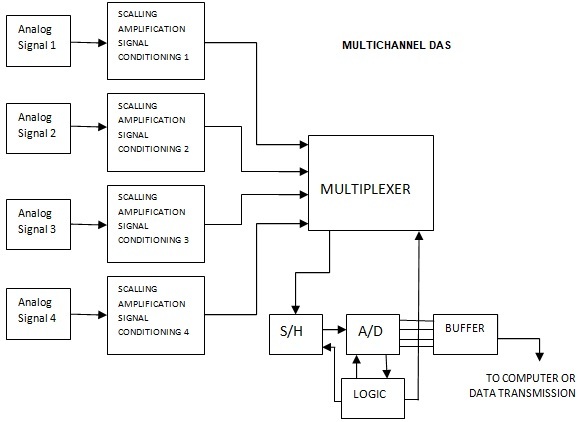 It can be observed from the block diagram that one channel of the main digital multiplexed system has an input from a multiplexer. This arrangement is for input channels that have slowly varying data. Such slow varying data outputs from transducers can be pre-multiplexed in any of the available forms. This results in sequentially multiplexed sub-channel. The sub-channel can be used as a channel feeding the main digital multiplexing system. A single high quality data amplifier can be used for handling multichannel low level signal. Such an arrangement is shown in Figure. Each low level signal is provided with individual amplifier. Individual amplifier's output goes to sample hold circuit from which it is converted to the digital format. The input of the individual amplifiers can be either of the common mode type or differential type. This type of multiplexing is useful when large numbers of channels with low level outputs are available. As high quality amplifiers are available with affordable cost providing individual amplifiers is possible. The following factors are to be considered to implement low level multiplexing satisfactorily. 1. Guarding is to be provided for each channel. 2. Proper switching of guard is necessary. 3. Signal to signal and common mode to differential cross-talk is to be avoided. 4. Capacitive balance is necessary.